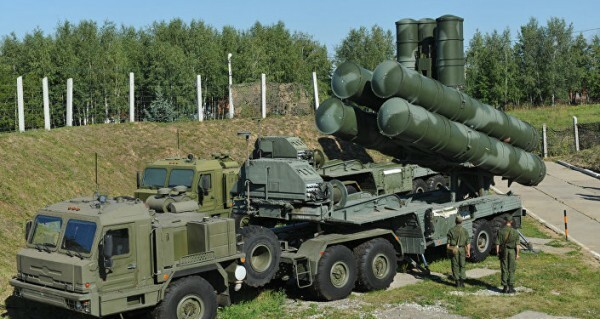 With only hours before the eighth annual BRICS Summit 2016 opens in Goa, India’s defense forces are anticipating the signing of a $5.85 billion deal for five new-generation Russian S-400 ‘Triumf’ air defense missile systems. The S-400 is believed to be able to engage all types of aerial targets including aircraft and VLO (Very Low Observable) craft. Former Chief of Staff of the Indian Army General Shankar Roy Chowdhury (retd) told The BRICS Post that he is looking forward to the signing of the deal with Russia. “It is supposed to be one of the best missile systems in the world,” Chowdhury, who is also a former Member of the Indian Parliament, said. “It is also being imported by Syria as well, to counter the missile strike from Israel. [The signing] is something to look forward to at the BRICS summit,” he added. Military analysts say that acquiring the S-400 ‘Triumf’ air defense missile systems will “drastically” boost India’s war potential, capacity and capability. “And when the capacity and capability improves, the war endurance of the nation and the armed forces will also improve,” General DB Shekatkar (retd), a defense expert, said. The S-400s popularity lies in the fact it can neutralise drones as well as ballistic and cruise missiles within a range of 400 kms up to an altitude of close to 32 kms. The S-400 ‘Triumf’ air defence missile systems is equipped with three different types of missiles and an acquisition radar capable of tracking up to 300 targets within the range of nearly 600 kms. Triumf is a system made of eight launchers and a control station. Explaining the reason for opting for a Russian weapons system, General Shekatkar said that India’s armed forces look for three criteria when considering arms procurement – reliability, ruggedness and redundancy. “It is for this reason why we are striking this deal with Russia for the S-400,” he added. “We have been buying weapons and technology from Russia from a long time, and Russia is our strategic partner. The past wars in 1965, 1971 and the Kargil war has proved that Russian equipment is reliable,” he said referring to the wars India fought with neighbour Pakistan. Other analysts say India is in real need of the S-400’s capabilities and therefore the imminent purchase makes for a very good acquisition for the armed forces. “India is signing some important deals with Russia on acquiring the S-400 and also the helicopters,” Nitin Gokhale, a senior defense analysts, said. Read more: Is an India-Russia S-400 deal imminent? China and Russia must consider establishing strategic military alliance vital for both countries in the event of war with US. The hotspot for potential war is the South China Sea in which China is roughly encircled by some 400 build-up US military bases made of missiles, warships and nuclear weapons. The other hotspot for potential war is the US missile defence systems strategically deployed in eastern Europe that pose a direct threat to Russia. What’s more the Obama administration has committed trillions of dollars in their nuclear arsenal and is still committing trillions of future dollars in preparations of war in space which threatens both China and Russia. The war with China means the immediate next target will be Russia and vice verse. China and Russia should know better that in order to live in peace you must prepare for war.